H.E former President of Ghana John Kufuor while releasing the report reiterated that issues of climate change are not new to African farmers since they have been with us from the 1980s however he noted that the report is significant as it has given clear directions for the needed actors to combat it in good time. As the second in the series of the African Agriculture Status Report, this volume seeks to provide an in-depth and comprehensive analysis of emerging issues and challenges faced by African smallholder farmers, and allow scholars and professionals to contribute practical and evidence-based solutions. The Report documents the effects of climate change on smallholders in Africa, the ongoing adaptation by farmers and livestock keepers, constraints to adoption of climate-smart technologies, and highlights areas where investments in African agriculture have the potential to be most productive. Fortunately, as this publication attests, there are many adaptation and mitigation options at our disposal. We need to be moving towards the widespread adoption of 'climate-smart' agricultural technologies and practices - not just in Africa, but globally. If we fail to do so, we risk greater food insecurity, higher food prices and rising poverty, as well as continued ecosystem degradation. 22 September 2014. New York. 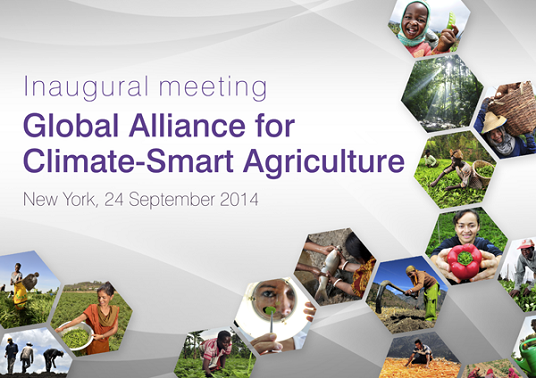 Africa Climate Smart Agriculture Alliance Side Event. This High Level Side Event will consist in defining Climate Smart Agriculture from an African perspective & describing the new partnership and its foreseen practical achievements. Lead speakers will include: Mr. John Kufuor, former President of Ghana & UNSG Special Envoy on Climate Change; H.E. Mrs. Tumusiime Rhoda Peace, AU Commissioner for Rural Economy & Agriculture; and Dr. Ibrahim Mayaki, NEPAD Agency CEO. Exposés will be followed by a panel discussion and an open debate. The NEPAD-iNGO CSA Alliance is a unique and innovative partnership between the NEPAD Agency, the international NGOs, on one side, and national level state and non-state players on the other, to leverage each other’s strengths to stimulate and support grassroot capacity and efforts to scale-up CSA in Africa. 24 September 2014. New York. The Alliance will hold its inaugural meeting. The meeting brings together Alliance partners, to share information and guide its inception year. There will be a live webcast on 24 September from 15:00- 18:00 PM (Eastern Standard Time).